What was life like at a 19th century Hudson's Bay Company trading post? Our Grade 6 students had a chance to find out (all while practicing their French, of course!) during our last Classroom Without Walls (CWOW) adventure. During a stop at five different stations, students experienced the lives of French Canadian and Métis fur traders. Here, a First Nations speaker taught students about cedar and its many uses in the fur trade. The cabin was filled with woodworking artifacts which the First Nations made to trade with the voyageurs who came along. Afterwards, students tried their hand at weaving, creating their own bracelets which were fashioned after the "ceinture fléchée' that the voyageurs wore around their stomachs. At the Maple Syrup Station, we met with a voyageur who taught us the health benefits of maple syrup and showed us how to make "la tire," something we call maple taffy in English. 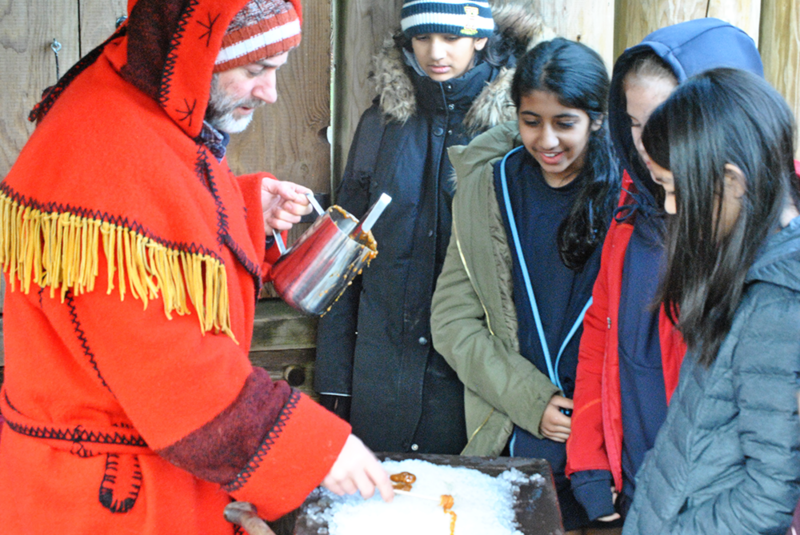 The voyageur poured the hot maple syrup onto some 'snow' (which for us here in BC has to be just crushed ice!) and the students were given a popsicle stick and learned how to twirl it into the snow to create their own delicious maple taffy popsicle. Students took part in an "Jeu D'Evasion," which we call an Escape Room. In pairs, students were given clues to find a nineteenth-century object. Finding this object would lead to a letter, and each pair's letter was used to contribute to one large letter with one final clue. Solving this clue would provide the solution for unlocking the door! The students accomplished this feat in no time. At this cabin, students learned about the voyageur's "joie de vivre," which is their enjoyment of life. Each student was given a set of wooden spoons and learned how to play them on our knees whilst singing some traditional French-Canadian songs in French. We were then taught some dance moves, which got everyone up and dancing. At the old store, we learned about beaver belts and the different types of fur that the voyageurs traded, along with their arms. We also learned all the French words for each item. 'Vive Les Voyageurs', is a celebration of the French Canadian and Métis fur traders who travelled all across Canada, including Fort Langley, in the nineteenth century. Why was it worthwhile for your students? Students had a chance to experience the French-Canadian culture and history that we hear about all the time. They also learned many new French terms, including learning that a 'baguette' isn't just a long stick of bread – it's also part of a musket! What was students' favourite part of the day? Making their own and eating 'la tire' (maple taffy)! Do language learning and experience go hand-in-hand? Absolutely. Without experiential learning, it is difficult to imagine people actually speaking a different language. It is important for students to realize that it's a real living language and culture that belongs to people not just overseas, but in our own country! you couldn't recreate here at the school? Seeing the voyageurs dressed up in their old and traditional costumes and teaching us their traditions was emphasized by the setting. By being in the old cabins, store, and schoolhouse, we were able to really imagine what it was like for them to live at that time. The beaver pelts hanging from the walls, the wooden cabin filled with many nineteenth-century artifacts and the beautiful First Nations' weaving and woodworking added to our whole experience that we would not have gotten had we been at school.